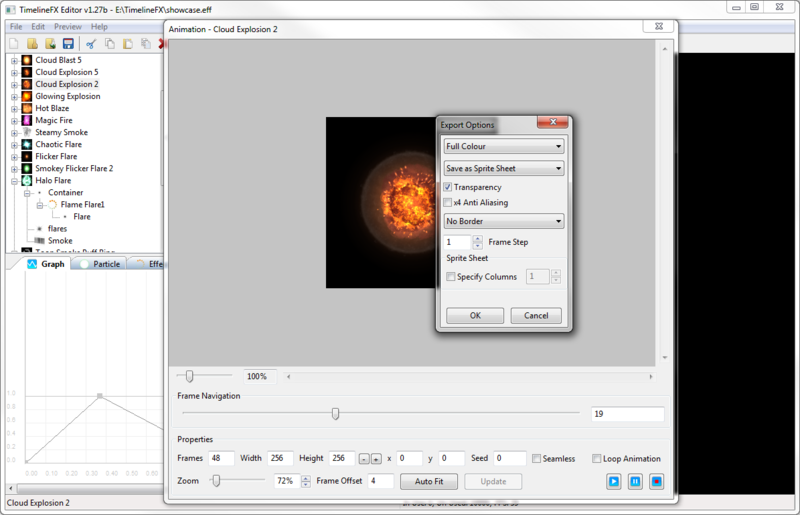 Export the particle effects as static animations onto sprite sheets, animation strips or image sequences in PNG format, or if you develop for the iPhone or iPad, you can export using the PVRTC format (Mac only). 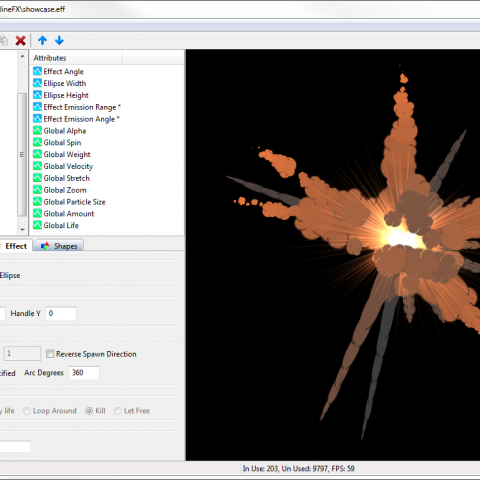 If you program games using the powerful Blitzmax programming language, you can also use the effects directly using the TimelineFX Module. 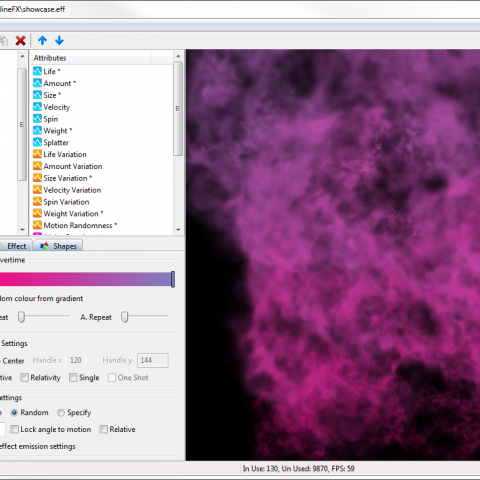 Create an endless amount of different and varied particle effects including explosions, smoke, fire, water, steam, bubbles, and much more! 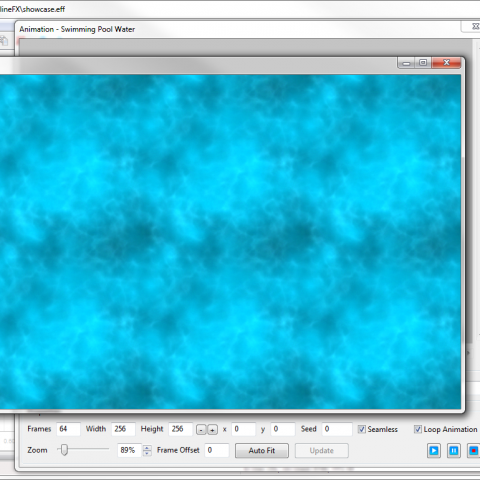 Animations can be easily configured to loop seamlessly with just one click of the mouse, and with another click, you can even make animations tile seamlessly too for use as animated textures. 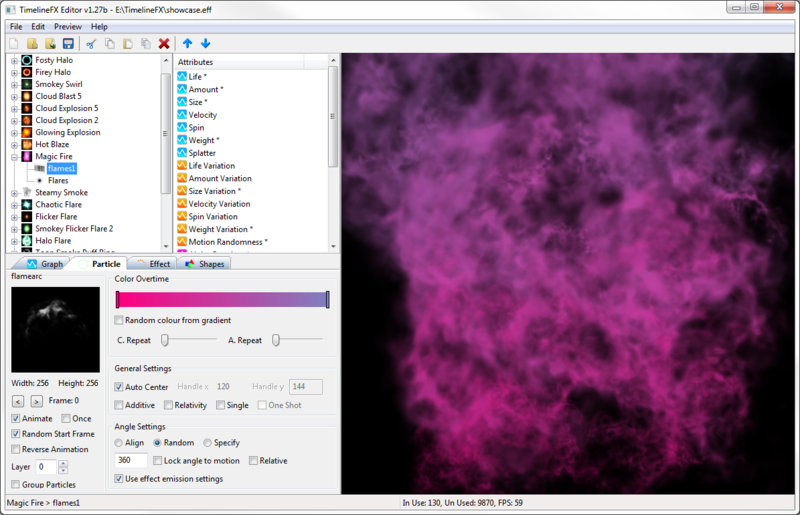 Including smoke, fire, explosions, water, flares, clouds and much more! 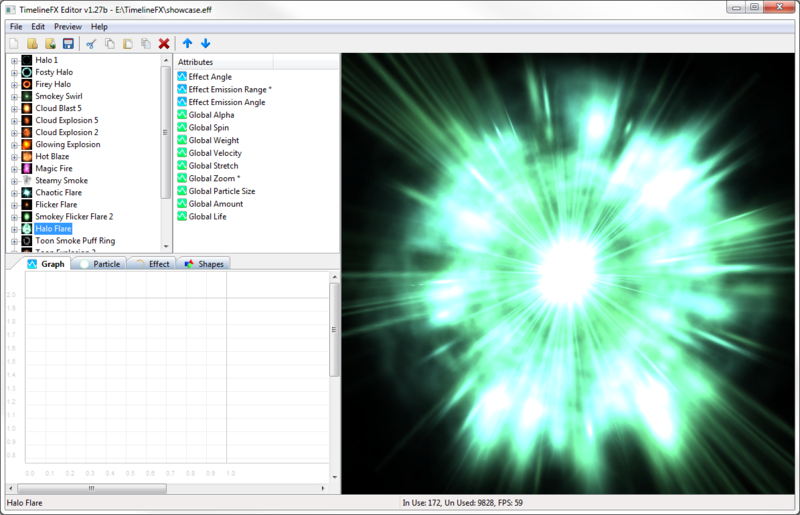 Plus, we also have plenty of free effects for you to download. 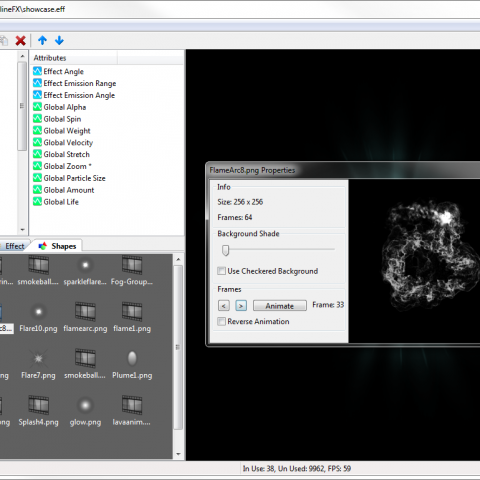 Easily export to sprite sheets with a wide range options, you can even export to PVRTC format specifically for iPhone as well as PNG, TGA and GIF. 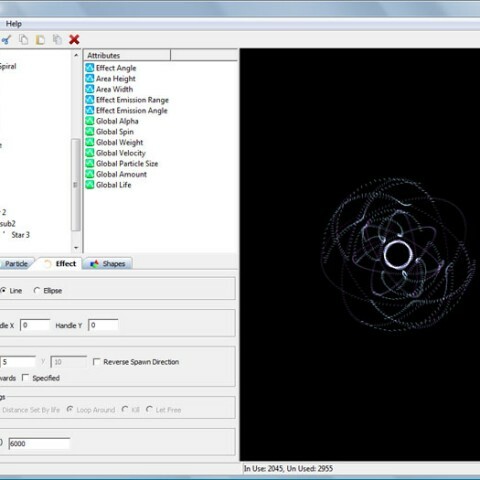 Seamlessly loop your animations with 1 click! In TimelineFX it’s easy to create an animation that loops seamlessly (like the ones shown on this page! 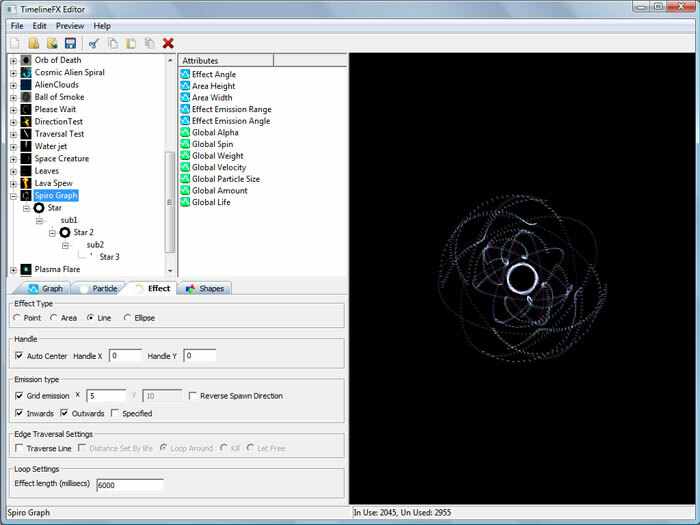 ), just check the Loop Animation box and you’re done! 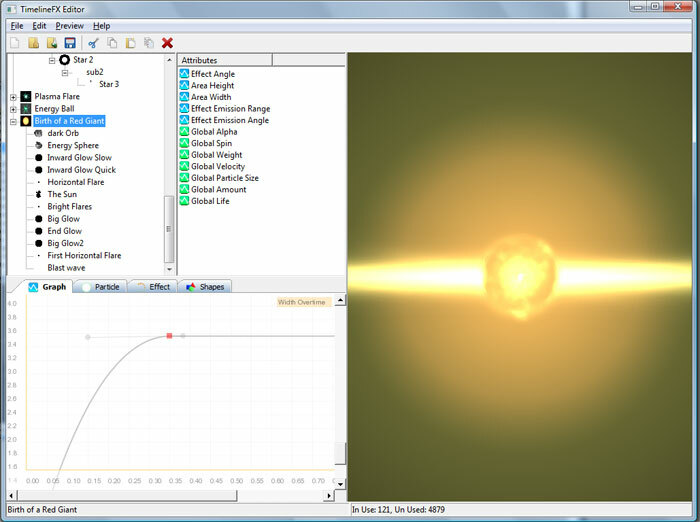 Create a simple effect with 1 emitter, or go crazy with multiple emitters with there own sub effects, you’re only limited by your imagination! 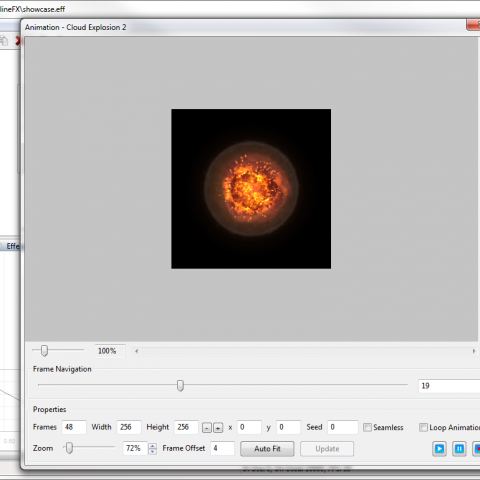 Loop Animation: With one click you can make your effects loop seamlessly! 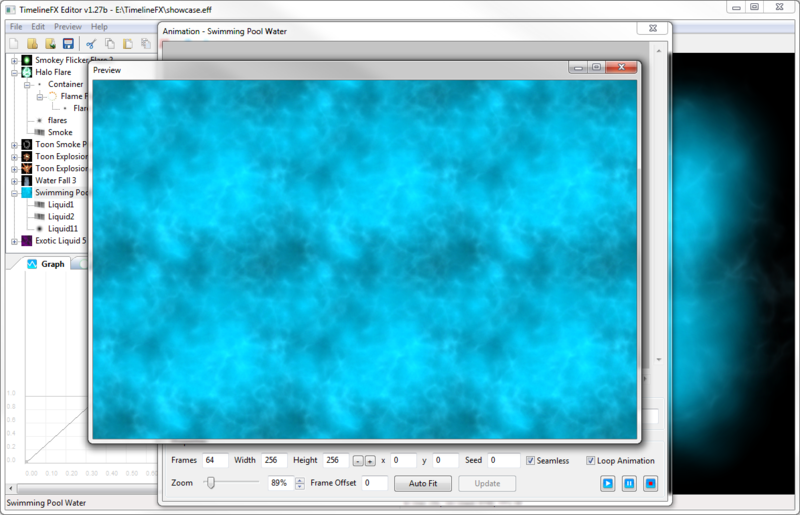 Make Seamless: Need to create animated textures that can be tiled seamlessly? No problem, just 1 check box and that’s exactly what you’ll get! 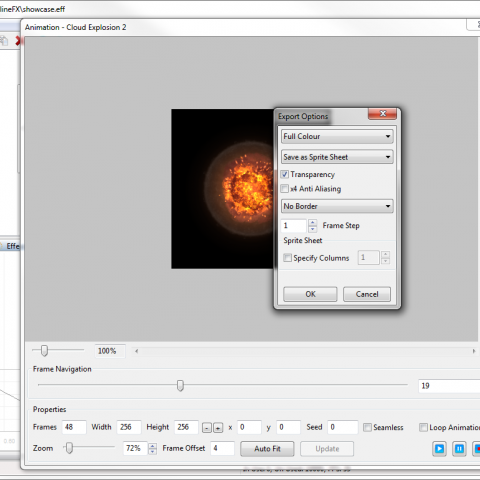 Multiple Export Options: Render animations in full colour, grey scale, 1 colour alpha and more. 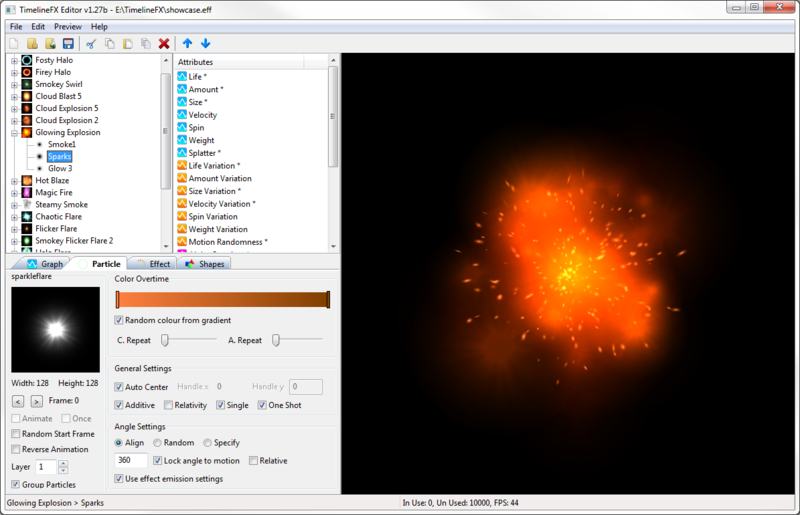 Handy if you want to create animated particles for your own particle systems, or apply your own colours dynamically within your game. 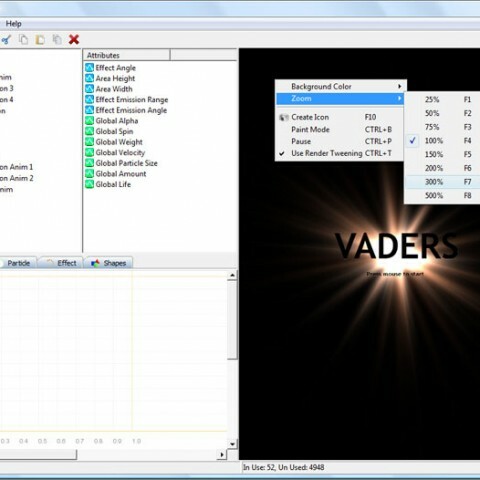 Additionally, you can save as a sprite sheet, where animation frames are kept in rows and columns, animation strips, or just a sequence of images saved separately. 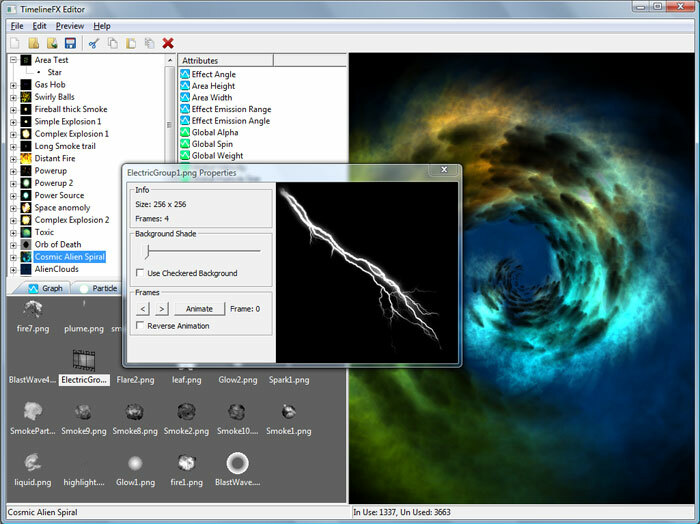 Handy Auto fit feature: One click and your animation be automatically resized to fit within your chosen frame size. 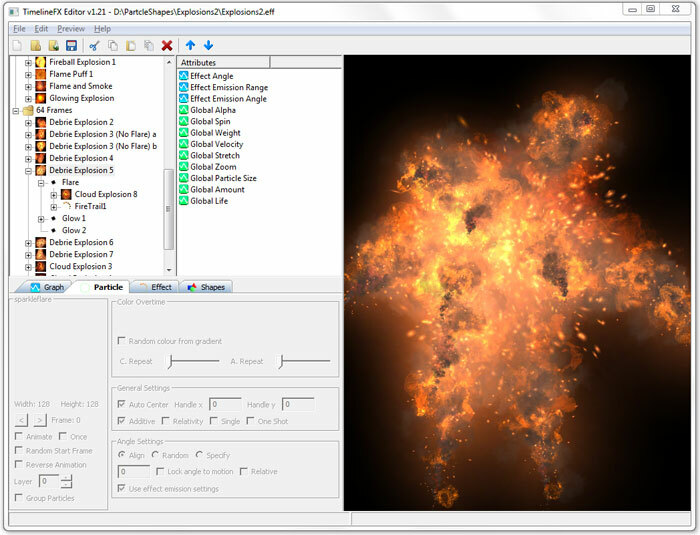 A full range of properties are available to fine tune all of the particle effects you create for your games. 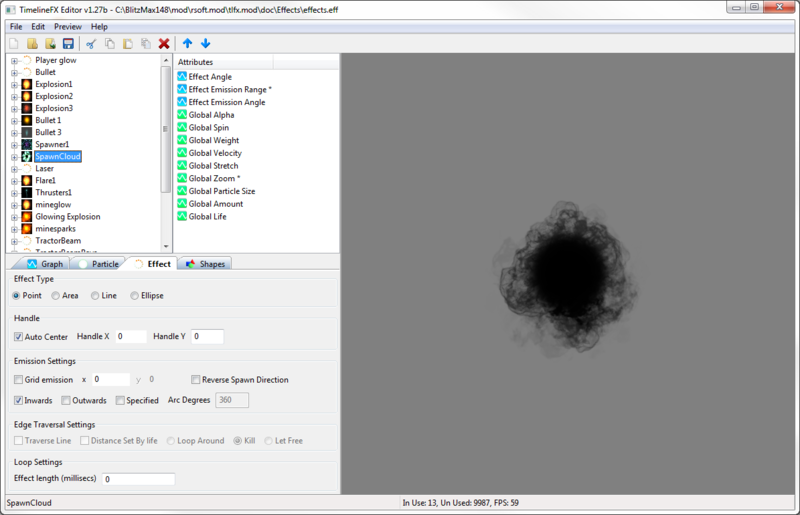 Change how particles are drawn on top of each other with an additive blend mode. 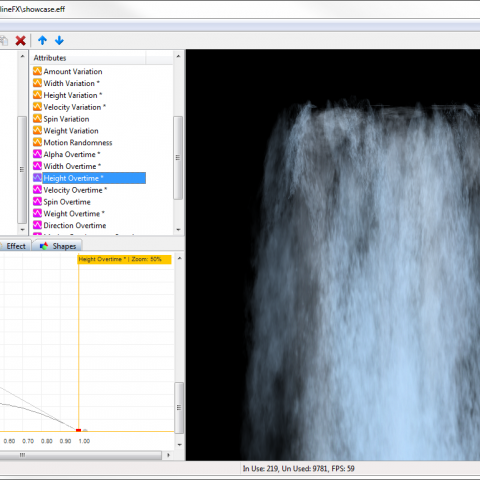 Adjust how each particle’s colour changes over time, plus, change angle, emission, particle shape settings and much more. All accessible with an easy to use interface, just adjust settings with a few clicks and instantly see your changes in the preview pane. 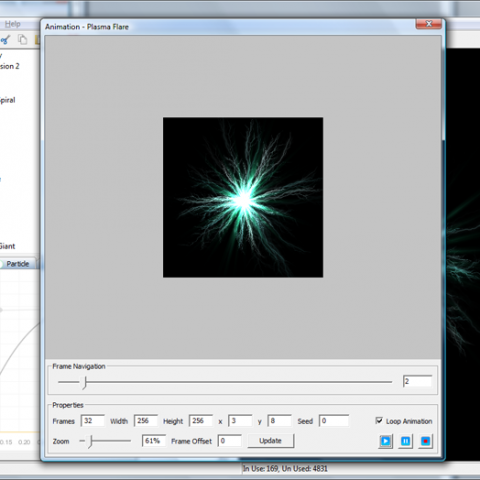 A particle shape is a bitmap which can be anything you desire for your effect. 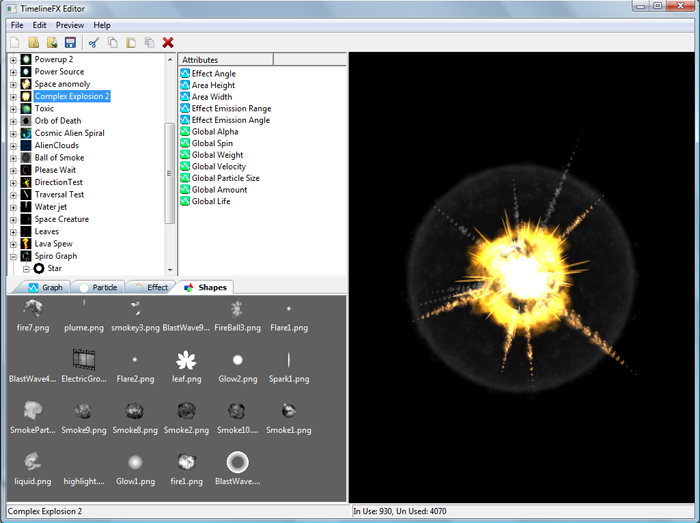 On top of that, they can also be animated to add even more depth and complexity to your particle effects to help your games come alive. 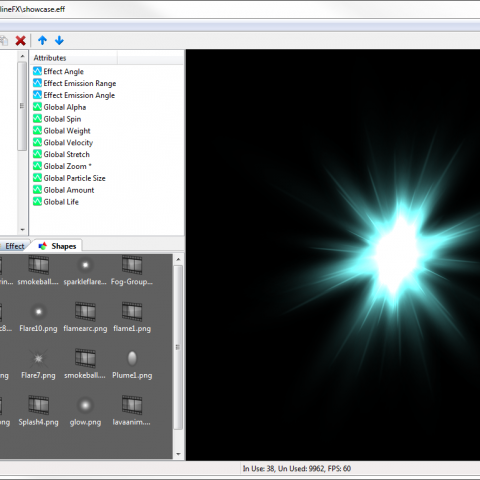 Simply load in your shapes and assign them to any emitter you want, all properties you have set such as colour and blend mode will be instantly applied. 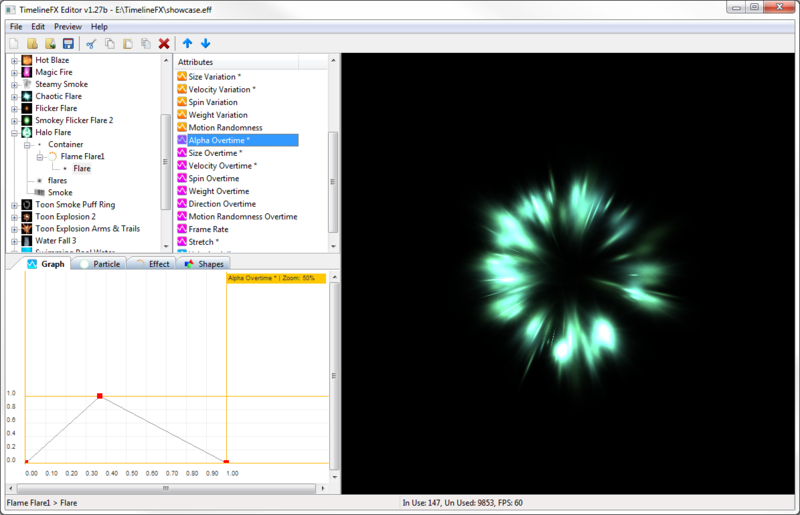 The TimelineFX Particle Effect Editor uses a powerful graphing system to provide full control over your effects. This means that every aspect of your effects can be precisely controlled over the life time of the effect. 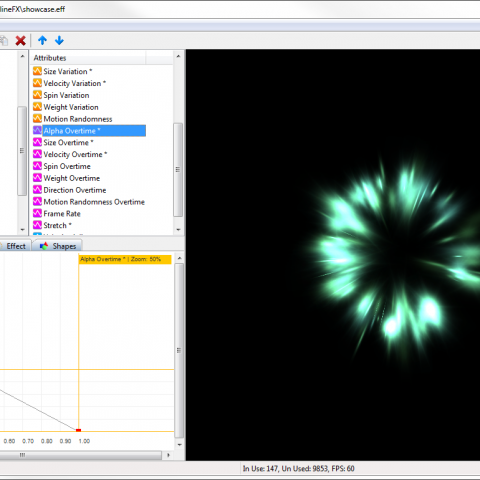 Just select an attribute such as size overtime, and plot it’s behaviour on the graph tab to easily make all the particles spawned by an emitter grow or shrink over the lifetime of the particle. 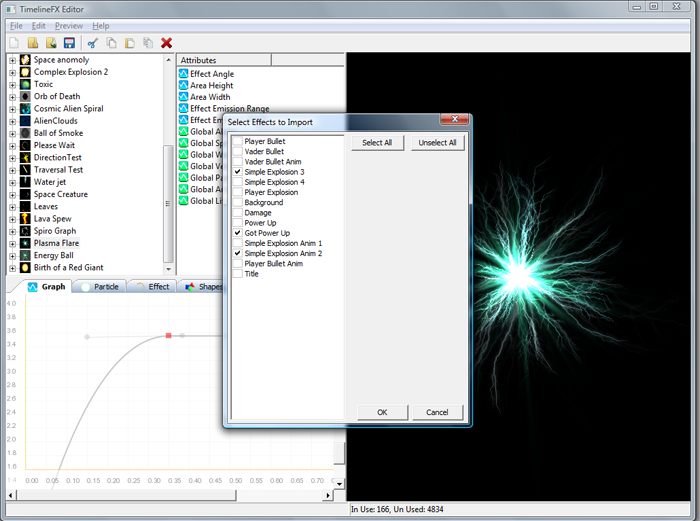 Many attributes are available for you to finely tune your particle effects, such as, amount, life, velocity, spin, stretch, alpha and many more. 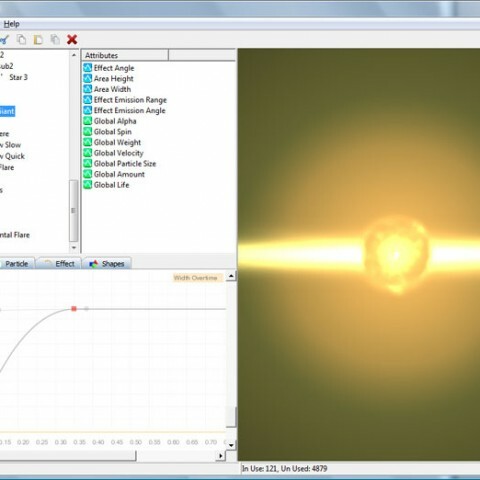 Just plot all your points on the graph according to how you want your particles to behave, and if you want even more precise control, convert graph points to curves for even smoother results. 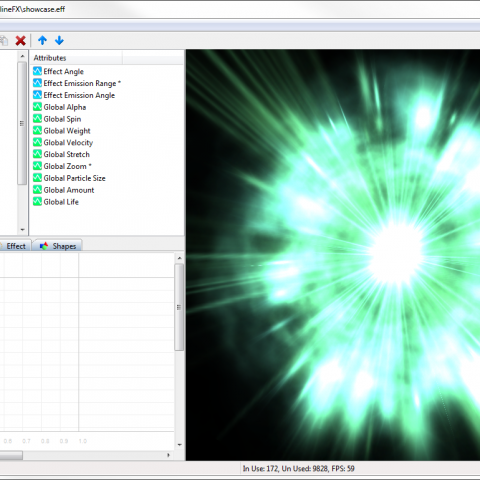 Plenty of effects libraries freely availble! 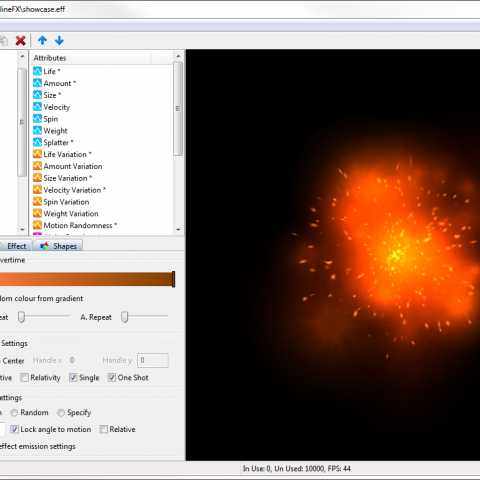 Make use of our royalty free Particle Effects, featuring explosions, smoke, fire, environmental effects like rain snow and wind, flares, auras and much more. You can either make use of them as they are or use them as a basis and tweak them to suit your own needs as you see fit. 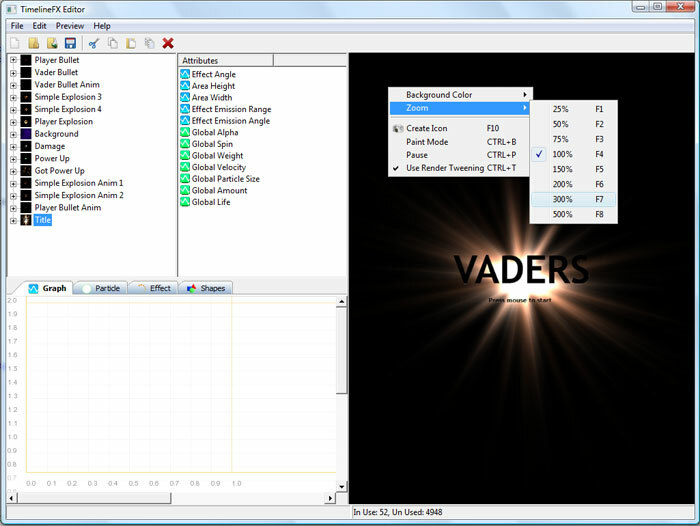 Click here to go straight to the emitters download page. 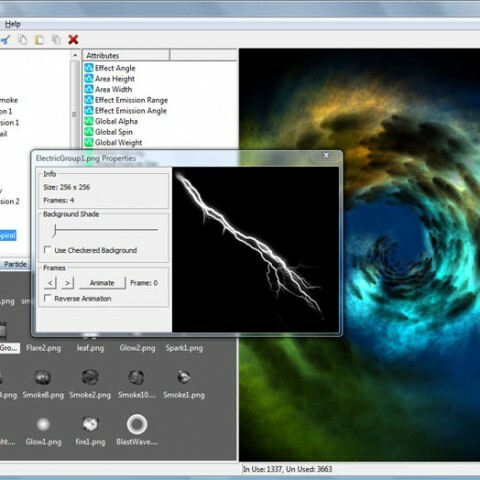 Simply download a library and load into the editor, make your changes and export. 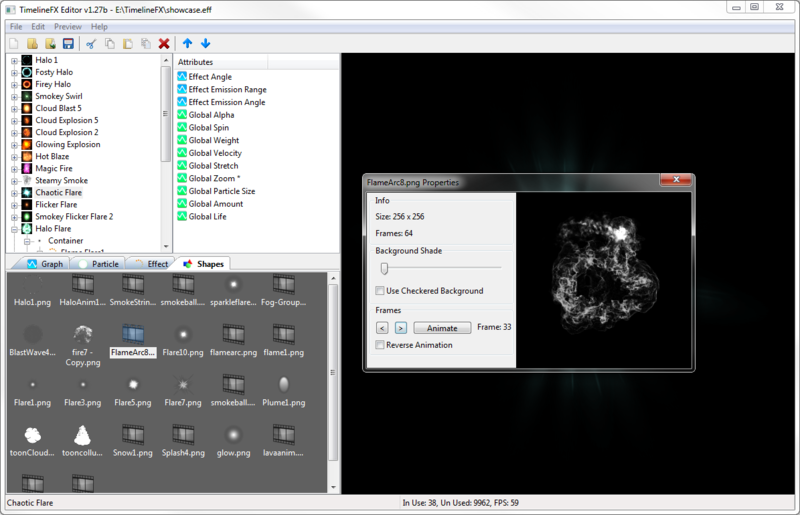 New Particle Effect libraries are being added all the time so keep checking back to see what’s new! You can also use TimelineFX directly within Blitzmax and Monkey by make use of the respective TimelineFX libraries for each languange. Monkey gives the unique advantage that you can code and use TimelineFX for multiple platforms including iPhone, Android, Flash, HTML5 and more! 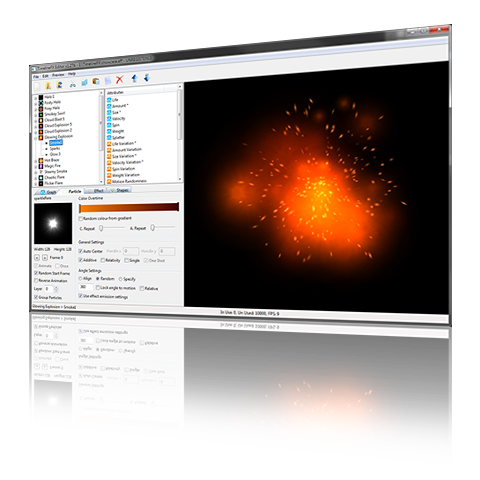 The library is incredibly easy to use with a powerful particle manager designed to do all the hard work for you. 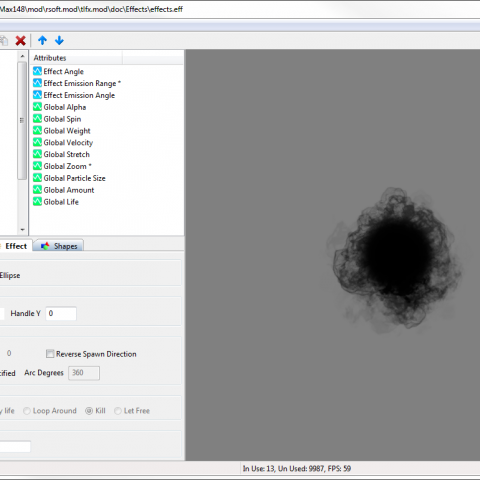 Head on over to the downloads page to grab the libraries, They’re completely free and released under the MIT license. Download Free TrialTry TimelineFX for free and start creating amazing effects. 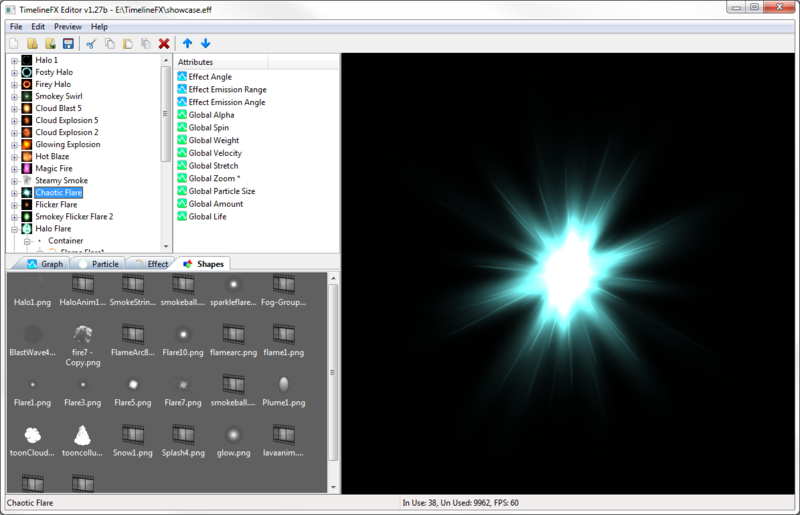 The trial version has save disabled and is limited to exporting 4 frames of animation. 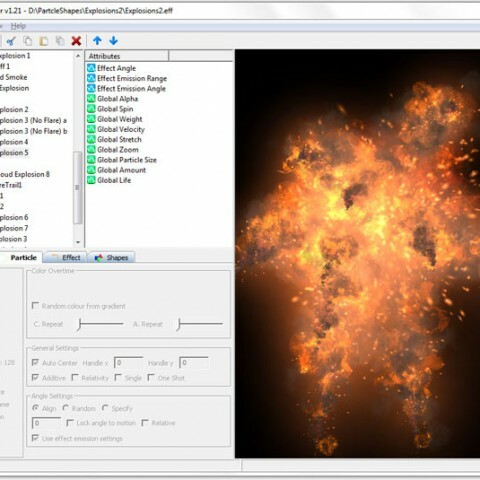 PurchasePurchase TimelineFX now for only £29.99 and start creating top quality particle effects for your games and applications. Effects LibrariesWe have loads of free effects libraries downloadable for free. Give yourself a head start, plus they're all royalty free. 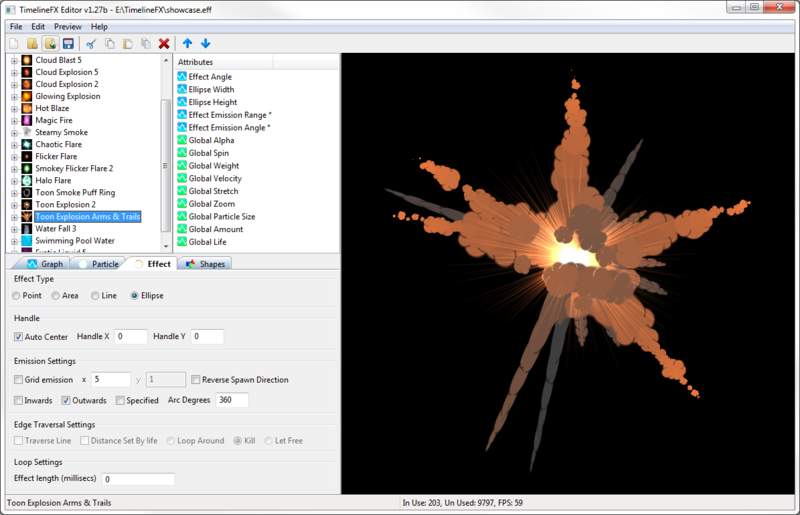 TimelineFX is astounding – even more so for the price. I’ve trawled a lot of PFX systems / editors in my quest to save myself a ton of work – and this has landed as #1 on my list. 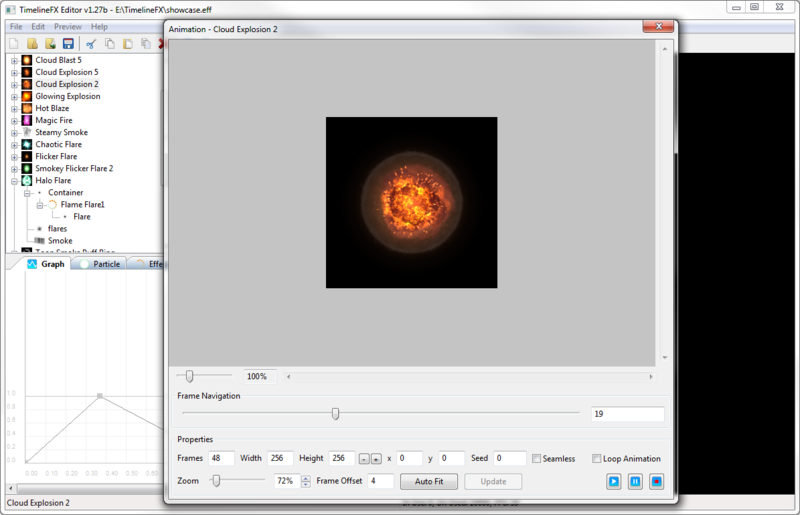 The price charged is worth it for the great free effects libraries alone! So I salute your ‘Indie’ oriented price point! I bought TimelineFX a few days a go and I just wanted to drop you a quick email to say thanks very much for a great product. 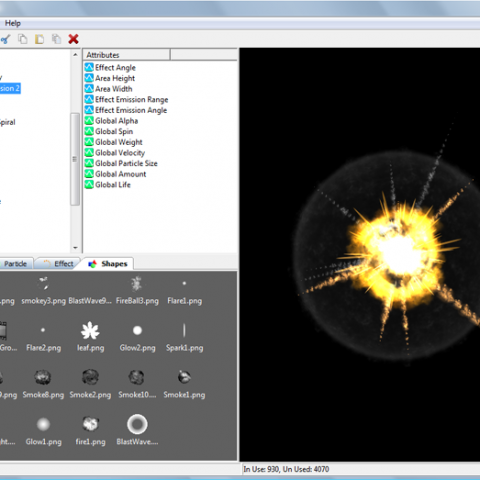 Excellently priced for a no-budget indie developer like myself, and bloody brilliant to use! I think your software is phenomenal for video games. Couldn't find anything like it on the internet. 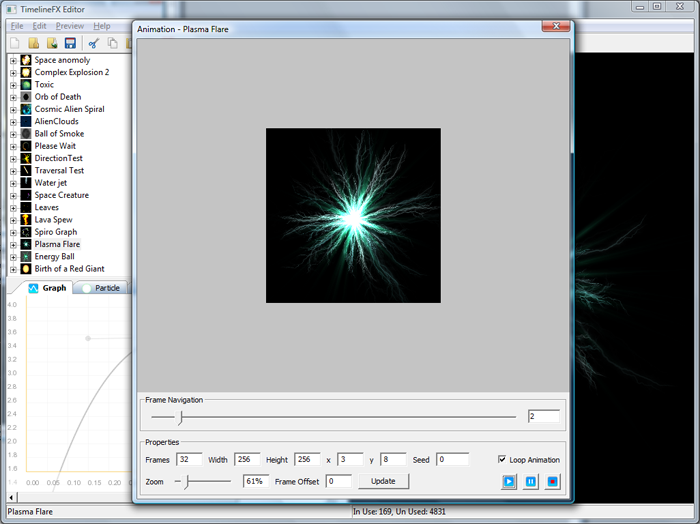 I just found your TimelineFX particle editor and seriously it is the best 2D one I have ever seen. 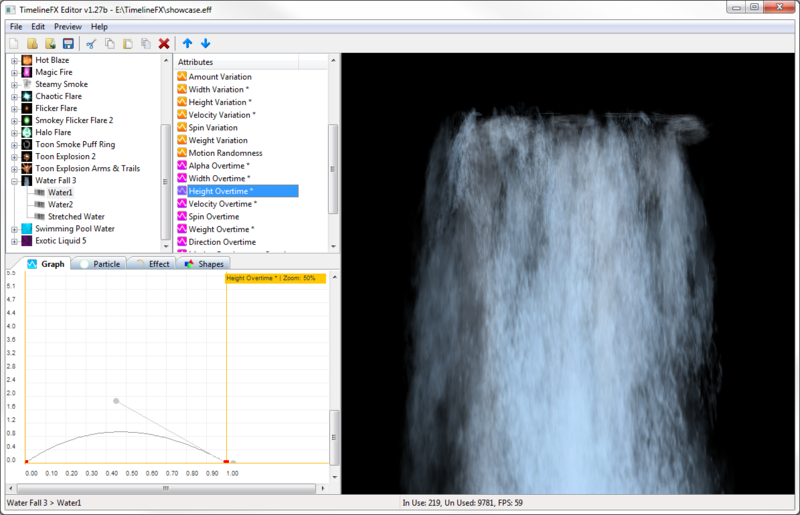 I purchased your TimelineFxEditor, and I have to say its one of the greatest programs I ever used for particle animations. 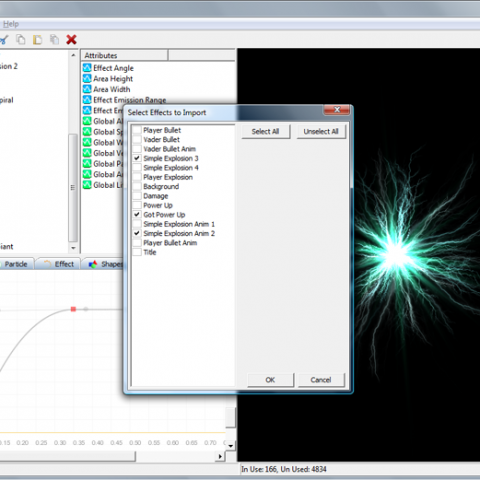 It is a lot more cost efficient and works perfectly with most 2d flash engines because of its versatile export function.